A Filipino maid experiences culture shock in the worst possible way when she comes face-to-face with some nasty Singaporean apparitions in The Maid, a suitably creepy, often artful horror flick from director Kelvin Tong. Review by Calvin McMillin: Imagine moving to a foreign country as a domestic worker. You’re placed with a family that you know nothing about. You don’t speak the language, and you’re unfamiliar with the local customs. Although you’re allowed to leave the house, your movements are ostensibly isolated to one location and you have little opportunity to make new friends. Further, you can’t call or e-mail your family members to let them know how you’re doing. In fact, your only form of contact – writing letters – is regulated by your employers. Although you could leave your position at any time and return home, it would be an ill-advised move since a) quitting would likely result in a bureaucratic and financial nightmare and b) your family is dependent on whatever wages you can send back to them. This potentially alienating, if not downright terrifying situation is the one put in front of the protagonist of Kelvin Tong’s The Maid, albeit with the appropriate genre twist – what if there were ghosts, too? Our heroine is Rosa Dimaano (Alessandra De Rossi), an eighteen-year-old Filipina, who emigrated from her home country to work as a maid in Singapore. Her little brother is critically ill, so whatever cash she can accrue from this overseas job is vital to the boy’s survival. Things start off fine, as she’s placed with Mr. and Mrs. Teo (Chen Shucheng and Hong Huifang), an old-fashioned Chinese couple who perform in a local Teochew opera troupe. The Teos, who communicate with Rosa via broken English, are kind and sympathetic, although a bit overprotective. When they learn of Rosa’s family situation, the Teos generously give her an advance on her monthly paycheck. Rounding out the Teo family is their mentally-challenged son, Ah Soon (Benny Soh), a seemingly harmless man-child with whom Rosa soon forms a sibling-like attachment. Of course, this is a horror movie, so weird things start happening to poor Rosa. For starters, it seems Rosa has arrived at an inopportune moment: The Chinese Seventh Month, a time when the gates of hell are said to be flung open and the dead walk among the living. Spooky, huh? Well, luckily for Rosa, there are a number of rules that she can follow to protect herself from the spirits of the damned: don’t swim during the Seventh month, don’t turn around if you hear someone calling your name, don’t talk to strangers on a deserted road, etc. Ghosts or no ghosts, this is probably good advice to avoid getting one’s self into trouble, particularly for a maid unfamiliar with the culture. Despite Rosa’s attempts not to offend the local spirits, she – like Haley Joel Osment before her – can see dead people. The Teos immediately surmise that this newfound power is due to Rosa somehow violating “the rules,” and while she does make a few mistakes here and there, those blunders don’t seem to be the real impetus for her ability to see the dead. The ghosts Rosa sees outside the home may scare the bejeezus out of her, but they’re pretty much harmless – these are spirits who are just continuing their daily lives as if nothing happened rather than looking to hurt anybody. In truth, the real problem is the female ghost that keeps appearing to Rosa inside the Teo household, haunting not only her day-to-day life, but her dreams as well. Any other woman would have buckled under the pressure, but Rosa has no choice but to stay on to earn money for her brother and hope she survives the month. Tired of living in fear, she eventually embarks on her own amateur investigation, but what Rosa finds in the end may be far worse than she imagined. For me, the genius of Kelvin Tong’s film is the way that it takes a situation that could be extremely frightening in and of itself, and ratchets up the terror a thousand percent through the dual use of horror conventions and a familiar mystery-thriller plot. Finding one’s self alone, isolated, and bound to an unfamiliar location is itself a scary prospect, and the film successfully exploits these circumstances to great effect. 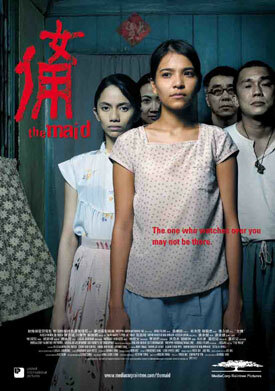 Although horror films can be analyzed in any number of ways, one interesting approach might be to ask, “What would the film be like without the monster?” In the case of The Maid, it seems clear that it’s attempting to examine the day-to-day life of foreign maids in Singapore, albeit under the cover story of a horror film. What is their life like? What rights do they have? What are Singaporean attitudes to these people? We may be attuned to the details of the horror plot, but these questions are lurking just below the surface, as we identify with a character who is vulnerable, even before the ghosts arrive. Further, having a protagonist who is put in the position of an outsider - as a Catholic, a foreigner, and a non-native speaker - creates all kinds of interesting effects. For one, it’s a way to de-familiarize the familiar, at least for Singaporean audiences. It also gives plenty of exposition on the Hungry Ghost Festival to the Teos for the benefit of international audiences, but it also highlights the peculiarity, if not absurdity of certain Chinese superstitions that many Singaporeans presumably take for granted as “true.” To have Rosa, who speaks and understands English and Tagalog, be placed in a context where Mandarin, Hokkien, and a very different kind of English amount to the nation’s lingua franca creates all kinds of narrative twists and turns as well. Who understands what and to what degree, both in terms of the characters and the audience, amounts to a very different kind of viewing experience. The film, as the saying goes, works on a lot of different levels. As horror films go, though, The Maid is competently effective and suitably creepy. Sure, it’s derivative of other recent horror fare, but I’d argue that it’s repackaged in such a skillful and culturally-specific way that it feels less like a lame copy (the various Ring rip-offs) and more like a quality addition to that contemporary stable of films classified as “Asian Horror.” The Maid boasts decent production values, excellent pacing, and a successful integration of Tong’s more consciously art house filmmaking aesthetic in an otherwise straightforward commercial project.